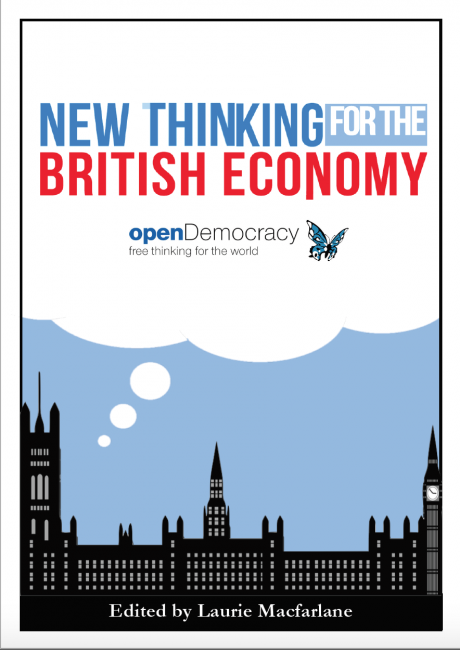 openDemocracy publishes a new eBook outlining a new vision for Britain's economy. Neoliberalism – the set of economic ideas and policies that have dominated politics for the past 40 years – is rapidly losing legitimacy in the face of multiple crises: stagnant or falling living standards, sharply rising inequality of income and wealth, financial fragility and environmental breakdown. At this critical juncture, new ideas about the kind of society we want to live in, and the future we want to see, are needed more than ever. 'New Thinking for the British Economy' brings together leading thinkers to outline the broad pillars of a new economic agenda, and the type of policies that are needed to get us there. As well as more traditional policy areas such as trade, finance, housing and industrial policy, the book explores a range of areas that are not typically considered to be within the sphere of economic policy but which nonetheless play a critical role shaping our political economy – such as the media, our care systems, racial inequalities and our constitutional arrangements. Contributors include Adam Ramsay, Andrew Cumbers, Ann Pettifor, Christine Berry, Craig Berry, Dan Hind, Johnna Montgomerie, Katherine Trebeck, Laurie Laybourn Langton, Laurie Macfarlane, Mathew Lawrence, Maya Goodfellow, Ruth Bergan, Susan Himmelweit, Thomas Hanna, Tom Mills and Will Stronge. New Thinking for the British Economy has been produced with generous support from the Friends Provident Foundation. All the authors have contributed to this volume in a personal capacity and do not necessarily endorse all the views expressed within it.